The chief executive of Gatwick Airport has apologised to passengers whose flights were cancelled on Christmas Eve as it was revealed those affected would be offered £100 worth of vouchers "as a gesture of goodwill". 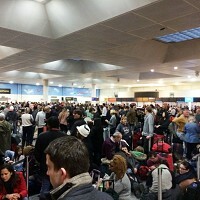 Localised flooding had caused power outages at the UK's second busiest airport, leading to a number of flight cancellations and long delays for travellers - underlining the imprtoance of travel insurance. Heavy rain caused local waterways around the airport to flood, in what Gatwick described as "extraordinarily adverse weather across the region". It said flood waters had "significantly exceeded flood impact projections" causing damage to electrical substations and switch rooms that resulted in partial loss of power to the North Terminal. An investigation has already been launched into the incident by the Civil Aviation Authority, and airport officials announced on Tuesday they had launched their own inquiry, which is set to be headed by David McMillan, a former director general of air traffic management company Eurocontrol and a non-executive director of Gatwick Airport. Mr McMillan will present his findings in February. Some passengers were stranded at the airport for 12 hours only to be sent home after they were told their flight had been cancelled. Gatwick chief executive Stewart Wingate said: "We appreciate that lots of our passengers were travelling to be with their families over the festive period and we are sorry that flights were cancelled and passengers left disappointed, particularly at this time of the year. "With this in mind, London Gatwick will be offering £100 of high street vouchers to each passenger whose flight was cancelled on Christmas Eve as a gesture of goodwill in recognition of the exceptionally difficult circumstances." Passengers who were affected by cancellations are being urged to email customer.services@gatwickairport.com with confirmation of a booking for a flight due to depart from or arrive at Gatwick Airport on 24 December and with their postal address. Qualifying passengers will be given a £100 voucher within 28 days of making their application.